This article is about the WarioWare character. For the character in the Super Mario World television series, see Dino Riders. Lulu is a character introduced in WarioWare Gold. Lulu is the self-proclaimed hero of Luxeville. She has arching skills and carries the Hydrocannon LX. She is often seen with Ruffington. After Wario steals Luxeville's golden pot, Lulu travels to Diamond City to get the pot back. Lulu makes various appearances in cutscenes and assists the player in the final stage against Wario Deluxe. She can also clear Wario Deluxe's obstacles in the game mode Wario Interrupts. After Wario steals the golden pot from Luxeville, Lulu tries to challenge Wario to get the pot back. After every second, sixth, and tenth microgame set is cleared, Lulu tries to prepare for the confrontation with Wario, but often gets distracted. She also appears in the final cutscene of Young Cricket and Master Mantis's story. In the final stage of the game, Wario uses the golden pot as his crown and becomes Wario Deluxe. After a certain amount of microgames, Wario starts to cheat and hide the control scheme hints of the next microgame. Lulu then appears and starts distracting Wario, so the control scheme hints can return. After the Boss Stage is beaten, Lulu reclaims the golden pot from Wario by squirting him with her water gun. Lulu then reveals to Wario that the golden pot is actually used in Luxeville as a potty. After the announcement, Wario gives the pot back to Lulu, who then returns to Luxeville. After returning to Luxeville, the village elder reveals to Lulu that the village recently installed a modern toilet, making Lulu's efforts in getting the potty back all for naught. Rank C – A mysterious little girl who barged into Wario's game tournament. Lulu has shockingly good reflexes. Rank B – Lulu's favorite things to eat are slabs o' fried meat and extra-nutty cookies. Sleepy after a meal. Rank A – Lulu has a knack for packing all sorts of things inside her ribbon. Snacks, weapons, you name it. Wario: Getting too tough kid? You can always give up. Lulu: NEVER! Fun's over! I'm taking back what's mine! Hey! Hey, you! I'll take care of Wario here. You go and win this thing! 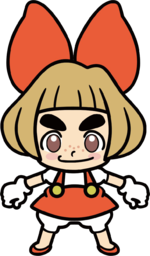 Before the reveal of her name, a Famitsu article on WarioWare Gold calls Lulu onnanoko, which means "young girl". Onnanoko is also the name of a character in Wrecking Crew '98 who has a similar appearance to Lulu. ↑ NintendoRU. (January 31, 2019). WarioWare Gold — трейлер Лулу (Nintendo 3DS). Retrieved January 31, 2019. This page was last edited on April 21, 2019, at 20:55.